As Timothy mentioned on his LiveJournal (and I do recommend clicking on that link not only to see endearing dog photos, but to see a shocking case of doll abuse in his banner, while he's still using that banner), a reading group asked if we'd come up with some study questions for When You Don't See Me. That was hard--not so much developing questions, but trying to remember what the questions should be about. That novel came out in the fall of 2007, which means he, Jim, and I were brainstorming it in 2005, writing it in 2006--and frankly, a few other things have happened to us since then. But we did come up with what we hope are good questions to provoke discussion, and he mailed them off. As for any news in my world, it's lying right there in the above photo. Need a better look? 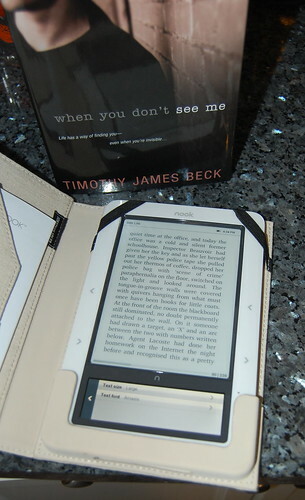 After quite a long time of going back and forth between whether or not I should have an electronic reader, and then which one I should get, and listening to sound arguments among other writers, librarians, booksellers, and readers, I went with the Nook from Barnes & Noble. I'm currently reading a new--to me--Canadian author who's been highly recommended. Three great titles were already on my Nook when I bought it. I've purchased a classic that I've always wanted to read, and downloaded two free titles. I'll never stop buying physical books, but this will ease a little strain on my bookshelves and after the initial investment, my book budget. 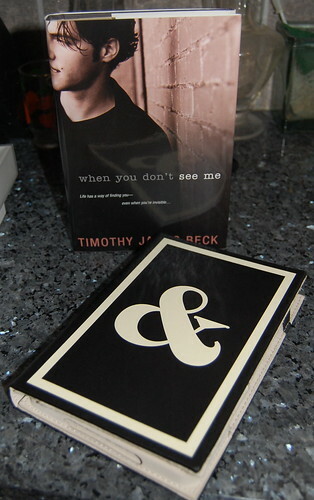 By the way, When You Don't See Me is available from bn.com in eBook format, and so is A Coventry Wedding. Just in case those are two titles you haven't purchased.